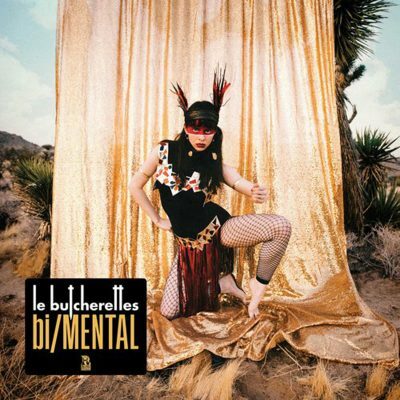 Le Butcherettes is a band out of Guadalajara, Mexico, and are currently based in El Paso, Texas. The band consists of: Riko Rodriguez-Lopez (guitar), Marfred Rodriguez-Lopez (bass) and Alejandra Robles Luna (drums). Le Butcherettes are lead by their firebrand lead singer, Teri Gender Bender (Teresa Suarez Coscio). Gender Bender is the center of the hurricane, and she keeps everything around her swirling with chaotic precision. Her voice is a work of art. When she sings, she sounds like a revolution. Le Butcherettes’ last three albums were produced by Omar Rodriguez-Lopez (At The Drive-In, The Mars Volta) on his own record label. Now with a new home, Rise Records, Le Butcherettes have brought in legend and icon Jerry Harrison (Talking Heads) to draw out a new and creative sound. Harrison both tightens and stretches out the guitar runs, and emphasizes the thump/thump/thump rhythm that Robles-Luna delivers—providing the intense immediacy needed for each track. Harrison handles Gender Bender in the most effective way possible – he stays out of her way. Harrison allows Gender Bender to tap in and bleed out her soul like an open vein.